TRAF6 is a member of the TNF receptor associated factor (TRAF) family, members of which are important for signaling induced by a variety of the TNF receptor family members. TRAF6 was initially identified as a signaling adapter for CD40, but has subsequently been shown to be a critical factor for the interleukin-1 receptor~Toll-like receptor (IL-lR/TLR) family. Therefore, TRAF6 represents a central point of con- vergence for the signal transduction by the TNFR and the IL-lR/TLR superfamilies, and thus plays a critical role in the regulation of innate immune responses. 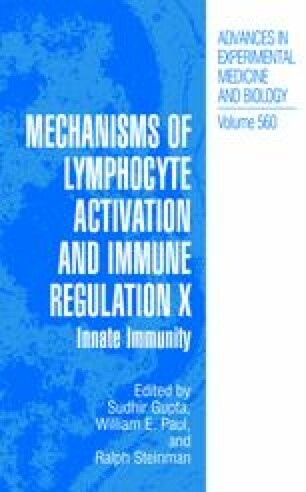 Considering the importance of the TNFR and IL-RITLR family members to the regulation of the innate immune system, the extent to which TRAF6 regulates the physiology of innate immunity, as well as the connection between the innate and adaptive immune responses, is of great interest. Here we have described the potential role of TRAF6 in regulating dendritic cell fates.